Stan Lee, the face of Marvel Comics and icon of Nerdom the world over passed away on Monday the 12th of November. It’s the end of an era really. For those of us entrenched in nerd culture his loss is as impactful as the loss of Gwen Stacy is to Spiderman. We spoke to some major comic book fans about the impact he and his work had on them though, and their responses were surprising to say the least. While the world at large reveres him, within the comic book community it seems he is a lot less popular. Of the people we spoke to today, most of them were not upset about the passing of Stan Lee, and at his passing wanted to draw attention to the vast difference in coverage between the death of Stan Lee, and the death of his long time creative partner Jack Kirby. 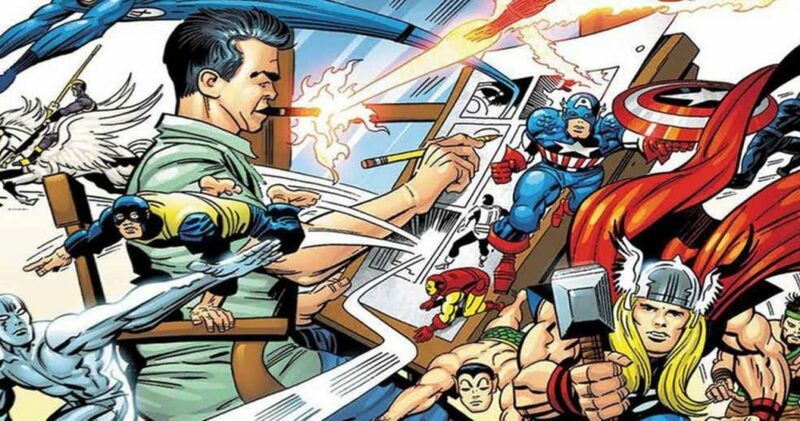 Often forgotten by Marvel Cinematic Universe fans Kirby was responsible for amazing characters like Captain America, Black Panther, and Professor X.
Jack Kirby amongst his family of creations. One such fan, Luke Pocock the owner of the Faceless Monkey comic and game shop in Truro’s Pannier market, spoke to us about the problems he has had with Stan as a creator and public figure. This is a pretty common viewpoint in the comic book community, who view Stan as the face of Marvel but Kirby as the brains and the heart of it. People interviewed in Bazbo comics Truro gave similar views when asked about Stan’s passing, with Darren Tresilie the store manager saying he was an icon but one with some issues, and shop worker Jake Archer not wanting to comment on Stan’s passing as he might ‘say the wrong thing’ given all the outpourings of love and affection being exhibited in the wake of Stan’s death. This is important to keep in mind at the death of any public figure you like or admire. Sure they did great things, things that perhaps touched millions and made the world a brighter place. But they were still human, and like anybody they were complex and maybe made some mistakes. It’s ok to have hero’s, but acknowledge their flaws as well as their strengths.